Music groups, singing and fun for babies, toddlers and pre-school children with their parents and carers in Dulwich, Catford and Forest Hill! Lucy is currently only running sessions in local nurseries and pre-schools. If you are a local nursery or pre-school and wish to find out further information please e-mail for details. Hello and welcome to Musical Bumps in Catford, Brockley, Forest Hill and Dulwich! My name is Lucy and I am delighted to be a part of the Musical Bumps team. I look forward to meeting and singing with you and your children soon. Hello – I’m Lucy! I have loved music since I was a young child, and have a strong passion for music in education. With a Bachelor’s degree in Music Performance, I use my skills to teach and entertain others. Over the years, I’ve been part of choirs and bands as well as performing on the stage! All this has contributed to my fun and friendly approach to teaching. I love to sing everyday, and believe it is important to sing with children every single day! The only thing better than singing? – MORE singing. 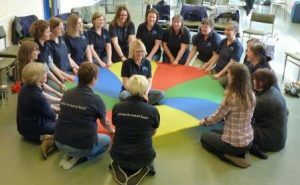 Being part of a group like Musical Bumps is hugely beneficial in the early months and years – not just for babies and toddlers, but for parents too. Lifelong friendships are made when your children are small and singing is proven to make us happy – there’s nothing like it! We offer a free trial class too – so there really is nothing to lose! Whether you’re a new mummy or have older children too, come along and discover the benefits of Musical Bumps! If you would like to take part in our fun, educational classes then please do get in touch to arrange a free trial lesson. I look forward to meeting you and your little ones soon! “My big brother, Tom, is an adult now. Tom is non-verbal but very physically able! He loves music on all levels – it can calm him, excite him and move him! Without his music, he’d have a very different life. As we grew up in such a musical household (my dad’s a professional musician too!) my brother was immersed in music – and I’ve seen all sorts of different ways that it has helped him. Lucy can offer one-to-one music sessions in the comfort of your own home. She also offers visits to special schools, adult care homes and the like. Please contact her for more information! Through our sister company, Music for Starters, we can offer curriculum music in the Early Years and Key Stage 1. Music Lessons are based on Kodaly (Hungarian School) methodology which builds on musical skills and concepts in a progressive and logical way. Using bright and interesting puppets, percussion and props, we ensure that our classes are – above all – musical! Please follow this link to find out more about what we can offer for your school! You can phone us on 07564 342542 or complete this form to book your free trial class. There is no need to complete the form if you are enquiring about classes, you can contact us direct using contact us tab on this page.